I have been intrigued by the Pattern Magic books for a while now. The basic idea is the same as the one in Make your own Dress Patterns (start from a sloper and design different variations), but the kind of variations shown here looked far more exciting and creative. When I noticed there was an English translation for sale, I grabbed them both. 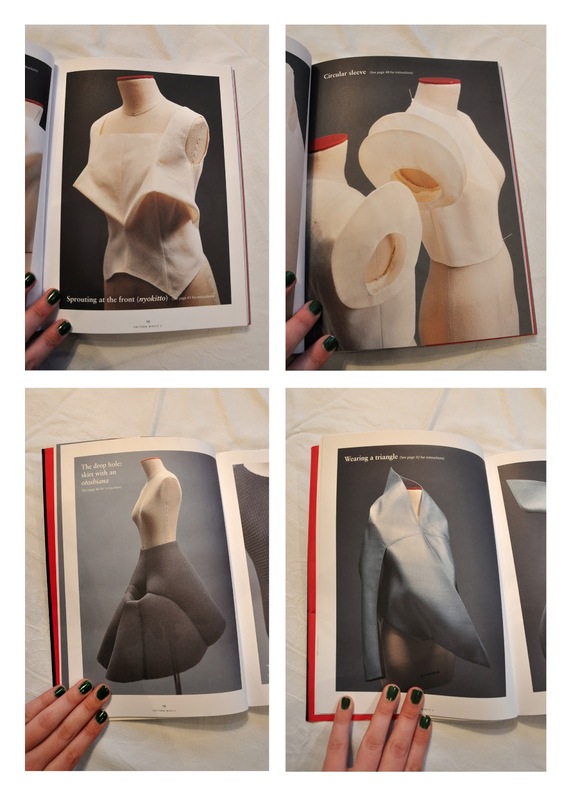 Both books have the same basic idea: start with a fitted sloper and change shapes and lines to create something new. The books show pictures of all possibilities, with intructions how to draft them on your own. I'm really glad I waited for an English version to come out, since I'm not sure I would have been able to understand anything from just the diagrams! At first sight only the more extreme examples jump out, and while they are very impressive, I don't see myself wearing things like this on a regular basis. They are excellent and interesting examples of how special garments like this are constructed, and I'm glad I have it just to know how it all comes together, even if I'll never make or wear it. The idea is very simple, but I love the structure of the knot. I'll probably use this on the back of my dress so I can still wear a bra with it, and play around with darts and seams on the rest. I've read through the instructions for most of these projects, and while they made me scratch my head at first, most of them are relatively clear to someone who knows the basics of patternmaking. It helps to fully visualize each step in your head while you are reading, to keep things making sense. I think these books are a great source for inspiration if you're looking for unusual details to add to your own designs! Hi Anneke, if you're interested, I've got an ongoing pattern magic project on my blog. I'm making a pattern out of these books every month! Next up is the bamboo shoot, will be published tomorrow. I love these books, I hope you'll have as much fun figuring these out as I do! Curious to see what you'll make.